Free 4-pack security Decals with purchase! This easy to install, “out-of-the-box”, system utilizes cutting-edge technologies to protect your home or small business against intrusion and safety hazards.This system keeps you simply safe and worry free! 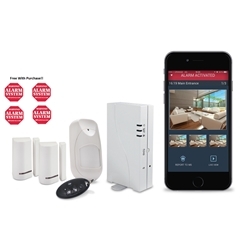 Easy to operate and robust, The WiComm security system is designed to provide you with peace of mind. Even during a power outage, it keeps fully working, monitoring, and providing alarm notifications. System configuration and control is performed on-site or remotely using a wireless slim keypad or keychain remote, a mobile device (smartphone or Tablet PC) running the Android or iOS operating system, or a computer / laptop running a browser-based Web application. System integrates with Risco IP cameras, at no additional cost, so you can see what is happening at home and even get notifications on your phone through the app based on triggers you set.